I enjoy discovering bright new voices in romance fiction. Last month, I introduced you to debut historical romance author, Elizabeth Michels (click here to read our interview) and her first book, Must Love Dukes. 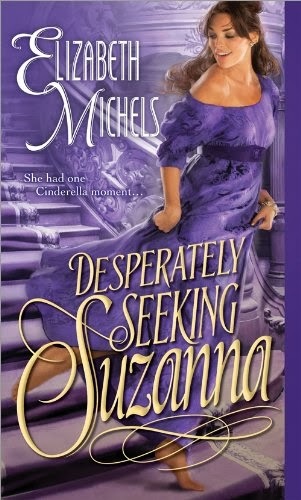 Sourcebooks recently released the second book in Michels' Tricks of the Ton series, Desperately Seeking Suzanna and it's just as delightful as its predecessor. Set at the same time as the first book, this one tells the story of Miss Sue Green and Holden Ellis, Lord Steelings, secondary characters readers will recognize from Must Love Dukes. Readers will also recognize some scenes from Must Love Dukes but, this time, told from the perspective of Sue and Lord Steelings. It must be said, however that Desperately Seeking Suzanna stands on its own and having not read Must Love Dukes first should in no way impair a reader's enjoyment. And enjoy it, I did! Miss Sue Green is facing an unimaginable fate: banishment to the wilds of Scotland as companion to a crotchety old aunt who hates sweets (I mean, really, can you imagine a life without chocolate?) if she can't manage to land a husband before the end of the season. If only she hadn't let her sister and cousins talk her into sneaking into that masquerade party, or let them ply her with champagne or transform her from sensible Sue into mysterious and sensual "Suzanna." For one night, Sue had felt beautiful and desirable and powerful...until her mother discovered her at the party, dragged her home and issued her awful ultimatum. Holden Ellis, Lord Steelings is a handsome, charming rogue keeping a secret with the potential to mire his family in ruinous scandal. He's made the decision to never marry - it would be too dangerous - but he's fascinated by Suzanna and determined to have her. Only he can't seem to find her. After an unconventional meeting at his aunt's masquerade - dancing down the staircase, Suzanna broke his nose with a rather enthusiastic high kick - the lady helped him to his room then proceeded to charm him...and fill him with desire. Then disappeared. His only clue is her connection to his aunt and uncle's new neighbors, Sue's cousins. When they return to London for the Season, Holden follows, determined to unmask the woman who has him tied in knots, even if that means suffering through numerous balls and dodging matchmaking mamas at every turn, including Sue's own determined mother set on matching him with Sue's younger sister, Evangeline. It is at a London ball that he meets Sue Green and convinces her to help him find Suzanna. In essence, she's helping the clueless man find...well...her. It's so much fun watching these two dance circles around one another as Holden slowly comes to realize that he's seeking our Sue's company more and more and thinking of Suzanna less and less. Elizabeth Michels has written a fast-paced Regency romp that is a delight but also tackles some deeply emotional issues. Sue is an intelligent, creative woman who is also a (secretly) successful artist but she's spent much of her life being told by her mother that she is plain, uninteresting and has no worth - the exact opposite of her younger, beautiful sister, Evangeline. I enjoyed watching her come into her own during this story and finally take charge of her life. Holden has spent most of his life holding people at a distance...for very good reasons. Were there times I wanted to bash his clueless head? Of course, but that made his capitulation, when it finally came, all the sweeter. I'm already looking forward to the next book in the Tricks of the Ton series. I'm hopeful that the heroine may be Sue's younger sister, Evangeline. She shows signs in Desperately Seeking Suzanna of having more substance than her beauty and behavior would imply. I have hopes for her and if her hero is who I think it is, I'd say we're in for another fun ride. Have you ever attended a book launch party or a book signing? A few weeks ago, I attended a launch party for Desperately Seeking Suzanna at a local public library. Elizabeth Michels shared her journey to publication with the readers present and read an excerpt from her new book. After the reading, she signed books while answering questions and chatting with readers. One has only to meet Elizabeth Michels once to understand why Desperately Seeking Suzanna sparkles with humor and charm. Here are a few photos from the signing. Librarian Siobhan Loendorf and Elizabeth Michels...and really good cake. Ah, the premise behind the book sounds wonderful! I'm going to have to get this book on my next outing! Sue sounds delightful, and I can only imagine the shenanigans that can happen when she's helping him find uh...her! It's a fun journey, Nicole. I hope you enjoy. And thanks for stopping by! These books sounds delightful and ideal. thanks for this fascinating glimpse. PJ, I have both of these books on my Wish List for my Kindle. I think that Elizabeth Michels will be an additional fave author of mine to come because her books sound wonderful! I have been to a group book signing, so to speak. The Indie bookstore that I haunt, or used to in pre-Kindle days, always had a fall luncheon wtih Iowa authors as well as authors from neighboring states. My goodness! The Midwest certainly has a lot of romance writers! I also went to a luncheon where Julia Quinn was the guest speaker. Thanks for the review. You and Andrea have given me many new books and authors to read over the last few years. Thank you!! I hope you like them, Deb! Your luncheon sounds like a lot of fun. I've had the opportunity to hear Julia Quinn speak on a couple occasions. She's bright, funny and always leaves me with a smile...just like her books! Glad we've been able to add some new authors and books to your library. Andrea and I love sharing the books we love to read! Words that make me smile, just like the stories Elizabeth Michels writes. What delightful sounding books! What adventurous lord wouldn't love a woman who breaks his nose with a high kick? I can't read wait to read these books! I have been to numerous luncheons and book signings and they are always fun. What I love most is being in a room with so many readers, people who love to read and especially people who love to read romance. And meeting romance authors, many of whom I have been reading for years is always a thrill that never, ever gets old! Louisa, I couldn't agree more. Meeting the authors whose books I've enjoyed is always a special treat. You may have met Elizabeth without realizing it at last year's M&M conference. She was one of the people featured in our "shoes of M&M" pictorial here at TRD. I love new authors, and historicals have a special place in my heart. Not only have I attented a book signing, once upon a time I worked in a department store's book and record section and I worked book signings. You would not believe the work put into those. Not only have I attented a book signing, once upon a time I worked in a department store's book and record section and I worked book signings. Love the cover of this book. I have not read this author before but love historicals. I have never been to a book signing but would love to attend one. She's a new author, Quilt Lady. Her first book, Must Love Dukes was released last month. Thanks for the giveaway. I've only been to one book signing at a local bookstore. Only one romance author is based near here and I don't think publishers sponsor tours like they used to. My grocery store has hosted few cookbook & mystery authors, but I didn't get a chance to attend. I agree, Kim. I think many publishers have turned their focus to cyber tours. There are still "in person" events but I don't think as many as before the explosion of social media. You're welcome, Diane! They are both enjoyable reads! A wonderful book which sounds enticing. Many best wishes. Great review! I am looking forward to reading both books! Thanks for the chance to win! Looks great . Another new author! Wow! Both books sound great! I always look forward to discovering new and exciting authors! These books and their author are now on my TBR list! Thank you for sharing her with us! This sounds like an enjoyable book and series. I enjoy books that have a sense of humor and these both sound like Ms Michels has imbued them with a wonderful degree of it. I can't wait to read them. I have been lucky enough to meet several authors and attended signings. It is always helpful to talk with the author and discuss their writing process and inspiration. I would really love to read this book because my name is Suzanne, and I was always called Sue by my Mom and my Brother! The book sounds delightful!!! I wish good luck to this talented Author! I've never had the opportunity to attend a book launch, but I've been on the lookout for one - it's on my bucket list to get to one with author(s) I read. This one looks like the kind of story I love. I've never been to a book signing or a book launch party, but would love to. I've been wanting to read MUST LOVE DUKES and DESPERATELY SEEKING SUZANNA. Thanks so much for this wonderful giveaway!